The office of Sheriff is the oldest law enforcement system known, being acknowledged as far back in antiquity as 600 B.C. Like the word ''sheriff'' itself, the office of sheriff has an interesting history. In Anglo-Saxon England, a ''reeve'' was an officer who was appointed by the king to be responsible for the public business of the locality. A high-ranking official, the ''shire-reeve'' was the representative of the royal authority in a ''shire'' or ''county''. The office of sheriff was continued after the Norman Conquest, and then known as a viscount. The office eventually returned to the title "Sheriff", and "Viscount" became an inherited title of nobility. The most famous holder of this office was the folkloric Sheriff of Nottingham, enemy of Robin Hood. In the United States a sheriff is generally, but not always, the highest elected law-enforcement officer of a county. The political election of a person to serve as a police leader is a uniquely American tradition. All law-enforcement officers working for the agency headed by a sheriff are called '''sheriff's deputies or deputy sheriffs and are so called because they are deputized by the sheriff to perform the same duties as him or her. They may be subdivided into general deputies and special deputies. The second-in-command of the department is sometimes called an Under Sheriff. This is akin to the deputy chief of police position of a police department. In the US, the relationship between the sheriff and other police departments varies widely from State to State, and indeed in some states from county to county. In some counties, the sheriff can be the most powerful figure, but in other jurisdictions the sheriff may do little more than providing such services as keeping the jail, transporting prisoners, and providing courthouse security. In many US jurisdictions, the sheriff also has duties with regard to service of process and summonses that are issued by state courts. The sheriff also often conducts auction sales of real property in foreclosure in many jurisdictions, and is often also empowered to conduct seizures of chattel property that is being seized to satisfy a judgment. The federal equivalent to the office of sheriff is the United States Marshals Service, an agency of the United States Department of Justice. There are about 3,500 County Sheriff's Offices in the United States ranging from 1 or 2 man forces to the 11,000 member Los Angeles County Sheriff's Dept. The average Sheriff's Office in the United States employs 24.5 sworn officers. The office of Laramie County Sheriff was established at the time the region was under the Dakota Territory, in 1867. Within the same year, the Territory of Wyoming was organized with Laramie County being the first county established; at that time Laramie County encompassed the whole of Wyoming Territory. In 1890, Wyoming was granted Statehood and by that time had been divided into thirteen counties. 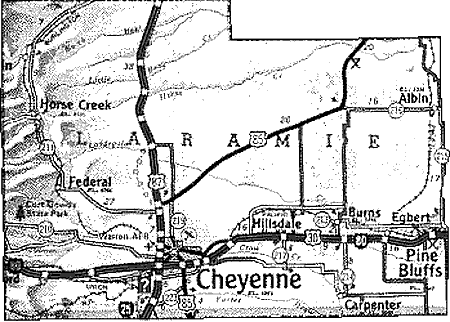 Laramie County included land which in early 1911 was separated into the present Laramie, Platte and Goshen counties. 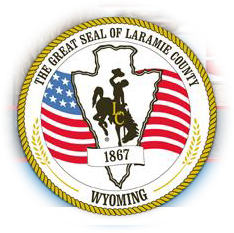 Today, Laramie County encompasses a 2,688 square mile area, and is the most populous of the 23 counties in Wyoming having a population of 94,483 as of 2012. The Laramie County Sheriffs' Office is one of the largest agencies of its type in Wyoming, staffed by approximately 186 full-time employees, with 145 of those positions being held by commissioned patrol and detention deputies. The department is divided into two divisions: Operations and Detention. The Laramie County Sheriffs' Office exists to serve the needs of the public and is committed to an agenda of proactive law enforcement using planning and foresight to help solve the problems within the community. * The first four officials served short terms due to appointment under Dakota Territory Law. *** Pat Hays, a young and able official, died very suddenly of a ruptured appendix. **** Norbert E. Tuck was killed in a railroad crossing accident February 15, 1961 in Iowa as he was returning a prisoner to Wyoming.